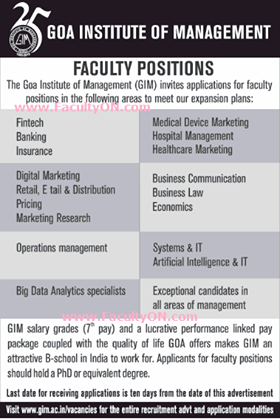 Goa Institute of Management,Sattari has advertised in THE TIMES OF INDIA newspaper for the recruitment of Faculty jobs vacancies. Interested and eligible job aspirants are requested to apply with in 10 days. Check out further more details below. About College: Life at GIM is bubbling with energy and joy owing to the sports and cultural activities planned and conducted by the students. The range of activities is an amazing mosaic of film making, choir, orchestra, movie club, theatre, quizzing, celebration of festivals and ‘learning with fun’ for village children from the neighborhood. A galaxy of leaders from all walks of society, both nationally and internationally, visit GIM and share their insights with students and provide invaluable knowledge and motivation. The spirit of competitiveness is instilled in the students through a series of competitions of business analysis, current affairs, sports and cultural events.